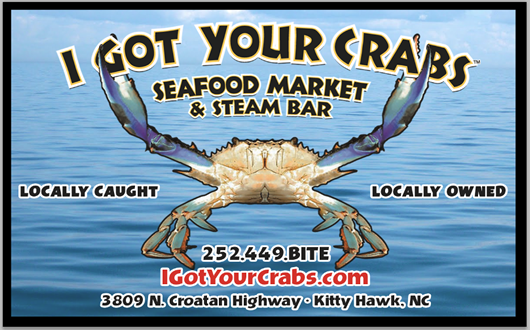 This entry was posted in Our Food and tagged crabs, i got your crabs, kitty hawk, lunch, obx, outer banks, restaurant, seafood, she crab soup, soup. Bookmark the permalink. Love theblog named CrabBlab! I’m putting together a kids educational program for a local Maritime Museum and wondered if you would allow me to reuse that for the section on crabs? I wouldn’t use it without asking. Honestly, it’s too funny, cute and catchy. I can’t come up with anything better than that. If I get the job, I’ll credit IGotYourCrabs – let me know what you think. Plus – next time I’m headed to Hatteras, I’ll stop and get seafood.